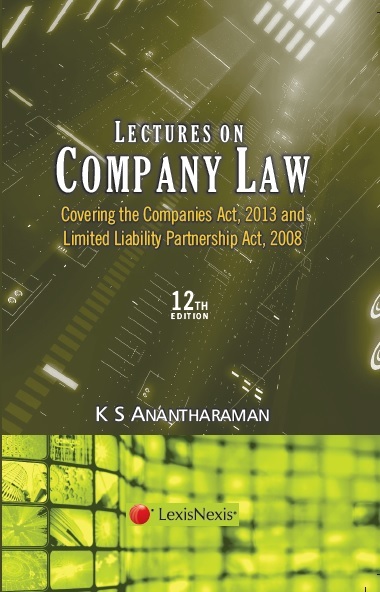 K S Anantharaman’s Lectures on Company Law is a compilation of the immensely popular and regularly updated classroom notes of the author. Presently in its 25 year of publication, this edition, like the previous editions, uses a step-by-step approach with an unwavering focus on the core concepts of corporate law. Concepts such as ‘legal personality’, ‘doctrine of ultra vires’, ‘perpetual succession’ are explained in simple yet lucid language. The author uses brevity, frequent headings, illustrations and tables to make the book reader friendly. The present edition has been updated to reflect the regulatory position under the Companies Act, 2013 and rules issued under the new Act. The author has explained key features of the Companies Act, 2013, in a precise and easy to understand manner. This edition also includes a chapter on the Limited Liability Partnership Act, 2008. The book is an essential guidebook for students of ICAI, ICSI, ICWAI and LLB courses. The book is also useful for practicing corporate lawyers, especially entry level transactional lawyers.